Steve Jobs, as you’ve probably heard by now, is taking another medical leave of absence. The last time he took one in January, 2009 it was for six months and it turned out to be for a liver transplant, likely related to his earlier bout with pancreatic cancer. This time the leave is indefinite and Apple is not going into any further details about his condition. One thing Wall Street hates is uncertainty. 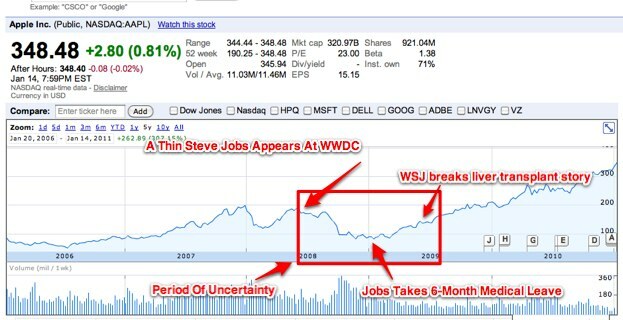 Just look at what happened to Apple’s stock between June, 2008 (when a very thin Steve Jobs appeared at Apple’s Worldwide Developer’s Conference, sparking speculation about his health), through his subsequent leave of absence, to June, 2009 (when the Wall Street Journal reported that he had undergone a liver transplant). During that period of uncertainty, the stock was down 23 percent, after dipping even lower (see chart). Will Apple’s stock take another hit this time around? Already, the stock is trading down on overseas markets, but the timing of the disclosure appears designed to minimize the impact of this news as much as possible. The announcement comes when Apple’s market cap is at its all-time peak, not to mention on a holiday when the U.S. markets are closed (MLK Day), just before Apple is expected to announce another breakout quarter. Ultimately, the relation of Apple’s stock price to Steve Jobs’ health depends on a few things: How will Apple perform in his absence; how long will he be gone; how serious is his condition; and when will more information be forthcoming. But mostly it depends on how much of Apple’s current $320 billion market cap is tied to the continued leadership of Steve Jobs. Apple’s momentum looks strong enough to carry it through 2011 with a steady stream of product updates and its product roadmap is likely set for the next few years (MG has more on that in this post). But the entire computing industry is on the cusp of a major transition to mobile, touch devices—thanks in no small part to Apple and Jobs. Apple is leading the way here, but can it continue to fend off the rest of the industry without Jobs fully engaged? We shall soon find out. Just remember, Apple’s been in this spot before. Jobs came back and it continued to thrive. Let’s hope history repeats itself.